‘I think this addresses the dichotomy at the heart of the play. In some ways we see four characters playfully engaging in the trivial minutiae, from moment to moment, as they fritter time away. But, at the same time, their grip on existence is tenuous. The landscape is punishing, they are worn and weary. They wait and hope for something to lift them out of it all. To achieve the ‘punishing’ or post-apocalyptic landscape in Waiting for Godot, Susanna is working closely with the production Designer, NIDA MFA (Design for Performance) student, Gabrielle Rowe. ‘She and I have been working to create a world to support the actors’ play, both literally and metaphorically. We want to create a sense of a landscape that has undergone a trauma, a catastrophe of some kind. It is a place where humanity and nature have been in conflict with each other, and where all that remains now is a burnt, smouldering aftermath. Susanna values her time at NIDA, which allows her to reconnect with her adventurous artistic side. 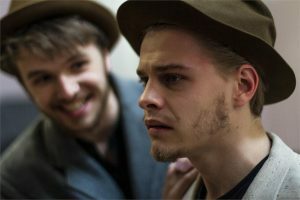 For tickets to Waiting for Godot or any of this year’s June Productions, visit nida.edu.au/student-productions.